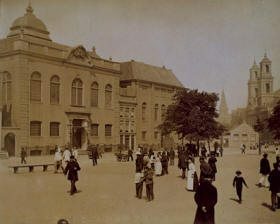 Choirs had enhanced the services at Amsterdam’s Great Synagogue for many years, of course. 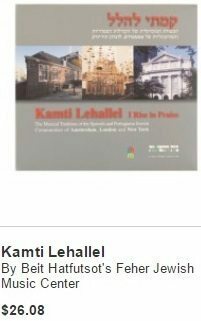 But when we talk about the “Choir of the Great Synagogue” what we mean is the group led by the celebrated choirmaster Samuel Henri (Sam) Englander between 1916 and 1942. Throughout these years the composition of the choir, a male double-quartet, hardly changed. This clearly helped Englander, known to have been meticulous at rehearsals and highly demanding, forge his choir into a vocal ensemble of exceptional homogeneity and quality. As a result, its reputation spread beyond Amsterdam, to the rest of the Netherlands and abroad. I have forgotten what I said exactly about your wonderful choir, but repeat it in general terms. This is truly a remarkable choir: for one thing, the volume of tone is astonishing considering the small number of voices. Their precision and discipline are most extraordinary. But above all, their interpretations are among the finest I have ever heard. They get to the very heart of everything they sing, they sweep one away by their enormous emotional power, they convince us by their sheer intensity. They are most certainly one of the finest choirs in the world, and it has been a joy to hear them. It was an opinion shared by a record company based near London, His Master’s Voice. It may even have been the same concert that persuaded it to record the choir of the Great Synagogue in performance. 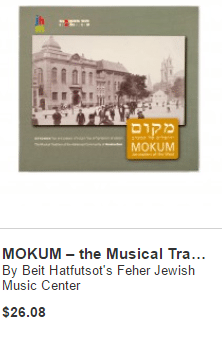 On October 16, 1929, eight liturgical and Yiddish songs, all of which can be heard on this CD, were recorded in a mobile studio sent to The Hague by the company. The ambitions of the choirmaster and his choir went beyond the embellishment of religious services. 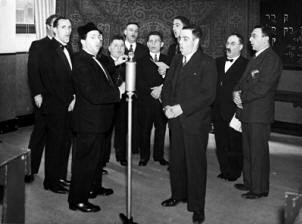 As the Amsterdamsche Joodsche Koor (Amsterdam Jewish Choir), it also performed in non-religious venues, including the Amsterdam Concertgebouw. The choir’s repertoire was expanded to include what were referred to as Eastern European Jewish folksongs and modern Palestinian-Jewish songs (i.e., contemporary Hebrew songs). In 1936 the Amsterdamsche Joodsche Koor produced a promotional brochure, published by Joachimsthal. As its foreword explained, the booklet was intended to present the choir to “concert agencies and directors of artistic organizations.” That it was able to meet these artistic aspirations was due in no small part to two remarkable soloists: Michel Gobets (tenor) and Jo Rabbie (tenor baritone). These singers were permanent members of the choir and invariably featured in its records, radio broadcasts, and concerts. I’d love the choir of the Great Synagogue to be larger. Not that it isn’t big enough in its present form, but if one of the men is unwell then I might as well pack up and go home. I would like the rabbinate to be less demanding in its requirements for choral candidates. After all, we have to be a little realistic. And … well, it’s preposterous that at a third-class wedding in a community like Amsterdam the ceremony should be graced … by only a three-voice quartet! Happily, the wedding music on this CD was recorded at a first-class wedding, enabling these songs by the choir to be preserved. 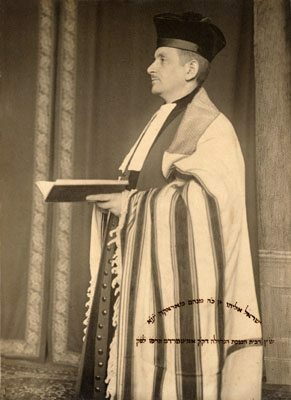 Englander’s comments reveal a certain friction between the choir’s artistic ambitions and the requirements laid down by the rabbinate. 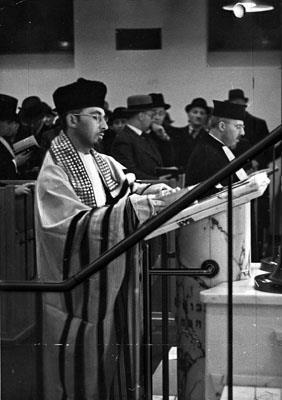 Englander may well have recalled his words some ten years later, when soloist Michel Gobets was prohibited from singing in synagogue. Two explanations have been suggested for the ban, which are not in fact incompatible. One is that, having in the meantime become a professional singer, he occasionally performed on the Sabbath. The other is his marriage to a non-Jewish woman. Of all of them, only Lou Nieweg is known to have survived the Second World War.